A common correction for dancers of all ages is to “move the arms from the back.” Often times this is very vague, but a common saying in practices of dance. While important to fulfill the visual aspect of certain styles of dance, this correction never specifies what exactly it means. So, what does it mean to move the arms from the back? To start one must mention the major parts of the body which are involved and dissect them further. With the big picture of which parts of the body are involved, one must look at the movement of the arms and the scapula, then move to the smaller intricacies of these body parts. The bones of the arm include the humerus, ulna, and radius. The elbow is a hinge joint that connects the humerus to the radius and the ulna. However, this joint solely bends and straightens the arm, so the correction to “move the arms from the back” is asking for more than the ability to bend and straighten the arm. The arm needs to be able to move up and down in the sagittal and frontal planes. The joint responsible for these actions is the shoulder joint, also known as the glenohumeral joint. The glenohumeral joint is a synovial ball-and-socket style diarthroidal joint that is responsible for connecting the arm to the trunk of the body. It is one of four joints that comprise the shoulder complex. This joint connects the humeral head and the glenoid cavity of the scapula. This joint is generally a vastly mobile joint and creates many motions, but which of these motions are wanted to move the arms from the back? To answer this question, one must also look at the movement of the scapula. Depression and lateral rotation of the scapula, via activation of serratus anterior, latissimus doors and inferior fibers of the trapezius creates correct alignment of the arms in second position, in ballet. The scapulothoracic joint is made up of the scapula, a flat bone, and its articulation with the ribcage. There are a multitude of muscles surrounding this joint. There is the deltoid, which is around the top of the shoulder, and the trapezius muscle, which starts in the neck and travels halfway down the back and encompasses much of the scapulothoracic region. The latissimus dorsi muscle, which is a big, fan-shaped muscle around the back, is used in scapulohumeral movements. Additionally, two important muscles are the subscapularis, responsible for rotation of the scapula, and the serratus anterior. These muscles create a majority of the joint’s movement. The scapula has the ability to elevate, depress, abduct, adduct, medially rotate, and laterally rotate. These are all common movements for the body, but in the context of moving the arms from the back, only some of these are engaged. Stabilization of the scapula, i.e., “moving the arms from the back,” is more difficult at extreme ranges of motion. For this correction, one must also look what is happening in the kinetic chain of the body parts listed above. When an instructor asks a student to move the arms from the back, they are not asking to actually move the back. Different parts of the kinetic chain are designed to be mobile, and others are designed to be stable. For this type of movement, one wants the scapulathoracic joint to be stable, and the glenohumeral joint to be mobile. In order to figure out how to do this to these joints, one must next look at the muscles responsible for moving or stabilizing these joints, respectively. When speaking about the scapulathoracic joint, the muscles that are involved are the subscapularis, serratus anterior, levator scapulae, rhomboids, and trapezius. Each of these muscles plays a part in the movement of the scapula. For the glenohumeral joint and the movement of the arm, the primary muscles involved are the latissimus dorsi, deltoid and pectoralis major. These muscles contribute to the rotation of the arm in the glenohumeral joint, and the flexion/extension and abduction/adduction of the arm in the sagittal and frontal planes, respectively. The latissimus dorsi contributes to rotation and abduction/adduction in the frontal plane. The deltoids are used to lift the arms in both planes, and the pectorals are mainly used to lift the arm in the sagittal plane. Now, where does the intersection of this all happen? All these movements are valid, but only some will get one to “move the arms from the back.” First off it should be recognized one is actually not moving the arms from the back. This correction is asking for the stability of the scapula while the arms move around it. Secondly, this correction changes in the context of different dance styles asking for different planes of motion. This essay looks at the correction in the context of ballet. In ballet, the scapula wants to be depressed and flattened against the ribs, and the rotated laterally. In order to do this, one must activate their lower serratus anterior and lower trapezius to depress the scapula, bringing it closer to the ribs. For medial rotation of the humerus, required in second position, it is the same muscles as well, but now the upper trapezius is engaged. Now that the scapula is stabilized, one can begin to move the arms in isolation while maintaining stabilization of the scapula. Particularly in ballet, one wants to use the deltoids and the latissimus dorsi to move the head of the humerus in the socket of the glenohumeral joint. All of these muscles engage in stabilizing the scapulathoracic joint, and mobilizing the humerus, a long bone in the glenohumeral joint, “moving the arms from their back” properly. Correct placement of arm in second position includes medial rotation of the glenohumeral joint. This correction can be tiring to hear class after class, but it still an important correction to care about. When ballet was developed, all the positions of the body were made to be the most visually appealing. Each position is meant to elongate the dancer’s figure. That is why the arms were chosen to be held this way for the visual effect. It also happens that activation of these muscles in this way achieve the best posture and an elongated spine. When the body is stacked, according to the movement efficiency model of the kinetic chain, it makes it easier for dancers to increases balancing time and engage in more difficult and quicker movement because they can move their weight as a unit. Unfortunately, this may be a hard correction to apply correctly. The muscles involved are being engaged over a period of time meaning that muscular endurance is the more important factor taking place. This requires dancers to fully stabilize their scapulothoracic area to keep their shoulder blades depressed and laterally rotated for stability, while still needing the mobility in their shoulder joint (glenerohumeral joint) as well to move the arms freely. Dancers need to work the endurance of the muscles to be able to engage all these muscles over a period of time. For example, when one is keeping the arms in second position during most combinations at the barre. To find the proper use of these areas, an exercise that can be done is planks, paying careful attention to protracting the scapulae and not let them protrude out the back. 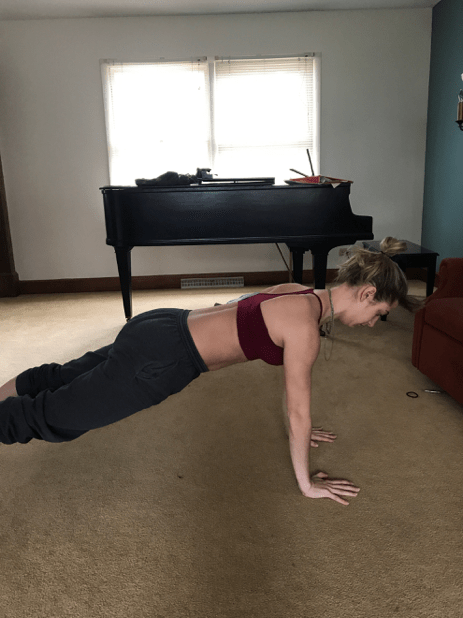 This exercise is helpful for finding the stability of the scapula, but also engages the pectorals along with the latissimus dorsi, deltoids, and musculature of the core. 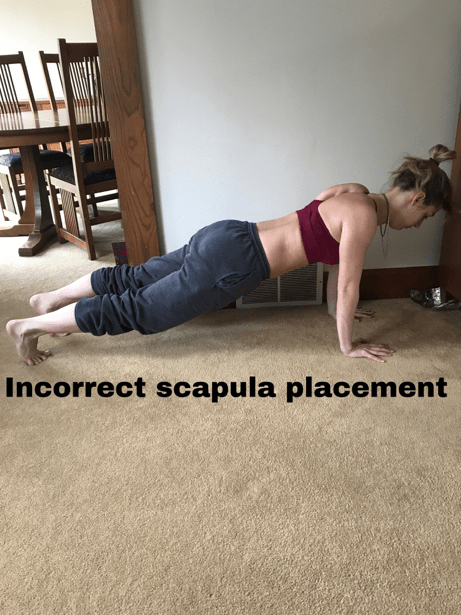 Once the muscles are properly found for the stability of the scapula, the most recommended endurance practice for this correction is to solely hold the arms in second or fifth position for an extended amount of time to increase the length of time a dancer can activate these muscle groups. This would be best practiced standing without doing difficult footwork that could distract the dancer from concentrating on the arms. The dancer could practice moving through port de bras or just sustaining the arms properly in second position for the duration needed. Correct stabilization of the scapula in a plank position. Anna Goetz is a current student at Loyola University Chicago in her sophomore year Majoring in dance and environmental science. She has been dancing for fourteen years trained in ballet, contemporary, jazz, hip hop, modern, and tap. She primarily strains in ballet, and modern/postmodern dance through the Loyola Dance Program, but is primarily a hip hop dancer with extended knowledge in popping, locking, house, b-boy, and commercialized hip hop styles. Alexandra Boly is from Saint Louis, Missouri. She is a current junior studying at Loyola University Chicago. She is workings towards a double major in Global/International Studies and History with minors in Dance and Peace, Justice and Conflict Studies. She has been dancing since she was three years old. She is glad to have the opportunity to continue studying dance as a part of her college education. Calais-Germain, Blandine. Anatomy of Movement. revised ed., Eastland Press, 2014.